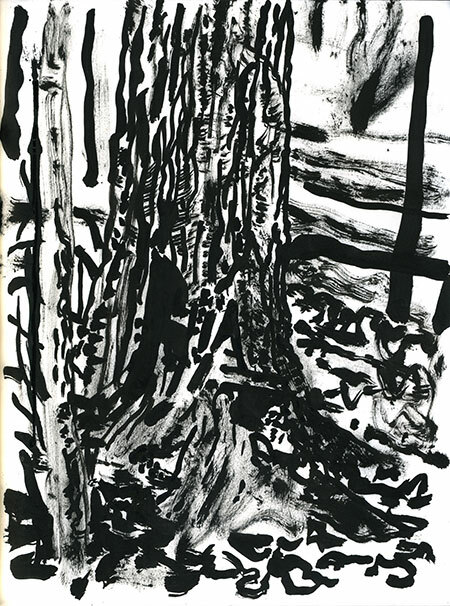 In a peaceful forest, as I drew/painted a tree, my ink and brush were freezing. It was 8º F (-13 C). 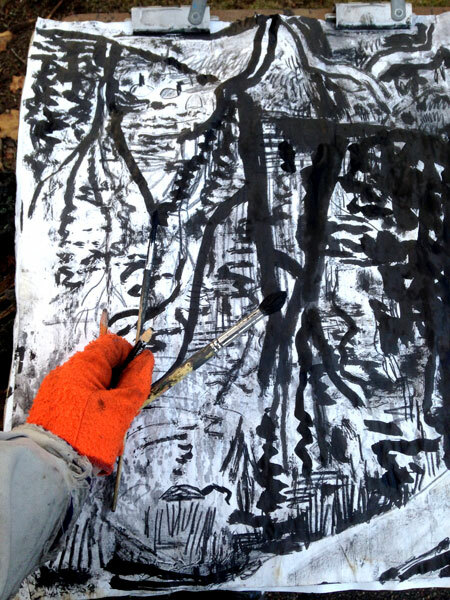 Luckily, the ink in the bottle wasn't freezing so I could daub away merrily, like Matisse on a sunny Summer day! I'd taken a walk into town for coffee and to work on a couple of books. The path goes through forest and around a frozen lake. It was beautiful (and very cold!). But my mind kept tripping over photographs I'd seen earlier of a man being pushed off a minaret to his death. The man doing the hurling/pushing, the executioner, wore a mask over his face. Why a mask? Why masks on the Kouachi brothers? God sees past the mask right? Are the killers afraid of men? Is it to spare the populace so they won't see the truth that one of their own has just murdered one of their own? Maybe a mask makes the soldier braver. My head spins and twists at the insanity of killing like this. I almost went down to the river this afternoon just to get away from my imagination for a little while. I just wanted the white noise and the needs of the drawing in front of me. And my freezing fingers and the urgency and clarity of the moment. The moment that drowns out the crazy world and replaces it with the simple fact of my consciousness struggling peacefully with itself and Creation. AND NOT HURTING ANYONE! Rob, I think, feel, like you. I have experienced these times like you. Like you I am outside with a book and a pen . Drawing. Nothing special. Just what I see. Antoine and the little prince: One sees clearly only with the heart. And then there are in Germany in the newspapers, in public and private conversations, in the Television, more and more People saying: You hold yourself out, you're no longer politically, you pull you back in an unrealistic world, the artists excape into apolitical. Eskaspismus! I have no good answers to such arguments. shall I show them my drawingbook? Better not. So I do not answer, I just go out the next day, like almost everyday, pencil and paper with me. What can we say to such people? Tell them "we are not enemies, we are simply different". Buy them a beer if it makes sense. 1. a mob reacting to things, all passion of some kind. 2. an individual before a scene or a thing, giving it his attention, drawing. I cannot choose, I was always number two.Thanks for your answer. So quickly. Astonishing. It was an easy choice… but still we see the mob everywhere at the slightest provocation: politics, religion, football, a discount sale of XBox!